Description: NECR heads north past the Palmer station. Description: Two things that no longer exist: The NECR as its own company and the Vermonter using NECR tracks. Description: 3844 shut off & parked on loco track with 2 other locos. taken from top of hopper car. Description: One of 2 conductors on the 608 today riding the trailing unit back to the main after pushing a string of cars into the lumber operation under the Gold Star bridge. Description: 608's other conductor guides the engineer down the main to pick up their short train and head back north. Description: A southbound New England Central train rolls thru Brattleboro yard on a very cold 1/3/08. I chase it as far as Vernon. Description: 3844 south is about to meet RMPX 9457 north, and pass on the siding before entering the yard. Description: Engineer Staying focused, as he backs 3844 back to the NECR yard. 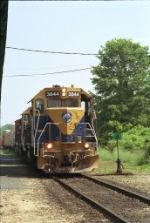 Description: New England Central passes CSX at Palmer MA. Description: Photo taken from Hospital Rd Monson Ma. 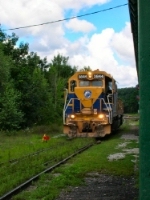 324 backing into the yard.